I always say there are two chicken dishes everyone should know how to cook; a classic roast chicken and chicken in a pot. Two of the most simple yet satisfying of meals, it’s hard to go wrong with either one. 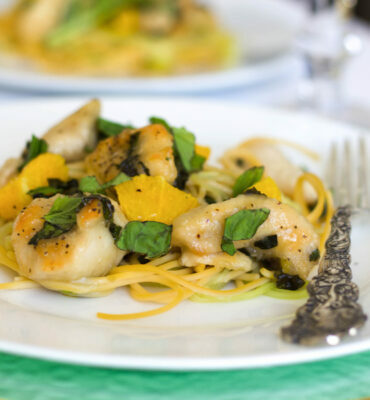 Both are easy enough to make for a weeknight family dinner but special enough to serve to guests. 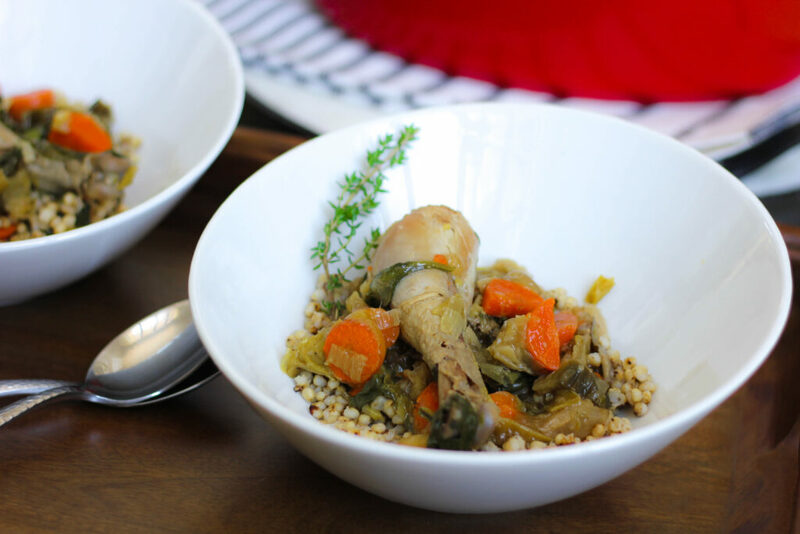 This recipe for Chicken in a Pot with Sorghum (or Barley) and lots of vegetables is one of those dinners you will likely find yourself relying on again and again. Ever since I started working on the upcoming Clean Cuisine Cookbook I find myself having less time to make dinner. It sounds crazy, I know, but since the chapters in the cookbook include desserts, breakfast, snack, etc. I don’t always have time to make a proper dinner. After testing clean Pineapple Upside Down Cake two times in a day the idea of making dinner from scratch can seem daunting. 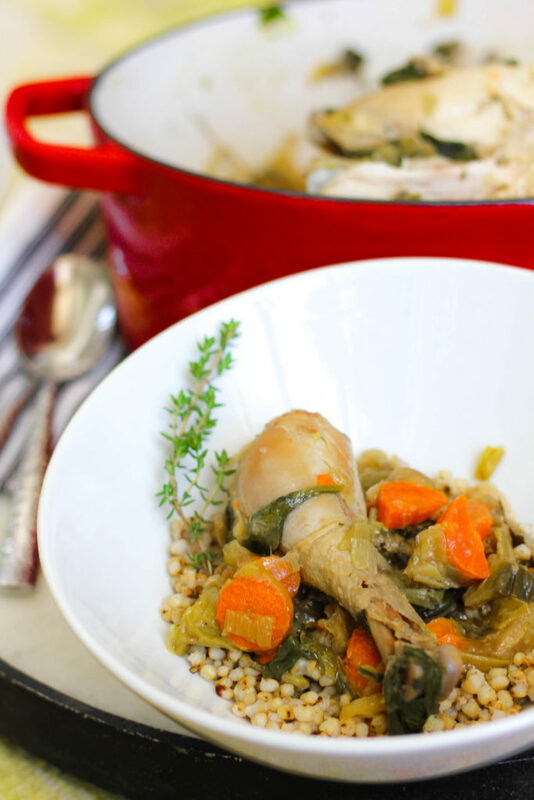 Since the recipe contains a protein, vegetable and grain, Chicken in a Pot is a one-dish meal that calls for nothing more than a simple green salad as an additional side. For the grain I like to use sorghum, but you can always substitute barley if you like. I would best describe sorghum as a healthy whole grain alternative to Israeli couscous. Unlike Israeli couscous, sorghum is gluten free. And although it doesn’t takes exactly like couscous, sorghum has the same appearance and a similar texture. It’s also an incredibly nutrient-dense food and a great source of plant protein, fiber, calcium and iron. Sorghum is also surprisingly rich in antioxidants and phytonutrients. I first started experimenting with sorghum using sorghum flour (which makes a great gluten free pancake recipe, by the way! ), but now I find myself cooking the whole grain more and more frequently. It’s something I say all the time, but it’s worth repeating; the easiest way on earth to cook whole grains is in a rice cooker. Having a pot of cooked whole grains ready made at all times is one of my five go-to staples for putting quick healthy meals on the table. I have a VitaClay multi-purpose slow cooker/ rice cooker in one and every three days or so I cook a new whole grain. Nothing could be easier. You simply measure the water, measure the grain and set the timer. SO simple! If you are not familiar with cooking whole grains in a rice cooker this Williams Sonoma blog offers a good overview. Ok, let’s make some chicken! Squeeze juice of 2 whole limes on chicken and use your hands to rub the lime juice in. Rinse the chicken with water, pat dry and season well with salt and pepper. Add the garlic, thyme and bay leaf to the inside of the chicken. Heat a large, heavy pot (or Dutch oven) over medium-high heat. Add the chicken, breast side down, and cook until browned, about 5 to 7 minutes per side (do not cook the chicken all the way through.) Transfer chicken to a plate and set aside. Pour the wine into the pot and scrape up any browned pieces, add carrots, leeks and radishes. Nestle the chicken on top of the vegetables. Add 3 cups of water to the pot and bring to a boil. Reduce heat to low and cook, covered, until chicken is done (45 to 55 minutes). Remove chicken from the pot and gently spoon out the vegetables. Skim off any foam or fat from the stock. Stir in the cooked sorghum (or barley) and heat over low heat to warm the grains. Season with salt and pepper to taste. Carve the chicken. Place a handful of spinach in 4 serving bowls, then spoon the sorghum (or barley) on top, followed by the vegetables and chicken. Serve at once. Why do you rinse off the lime juice? Hi Jennifer, the lime juice helps “brighten” the flavor of the chicken, but it is more of a “rinse” than a marinade. In other words, you don’t want the chicken to have an overpowering lime flavor if that makes sense?